This is an early-release version that we will update again in the coming weeks, and continue to actively develop and improve, based on your feedback. Watch video lessons in the app. word-by-word translation box only displays simplified Chinese, even if you have traditional on. highlighted text in word-by-word box included an underline. (We will remove this in the next version). Just downloaded and it looks / feels great! Good job. Something to add to the backlog, I would love to see the vocabulary section added to the app where I can then study/review them in a flashcard-like format. Nice piece. Workflow seems to be seamless. After I have downloaded a lesson and selected the lesson for learning, I got stuck. How can I go back from lesson learning? Another issue, the downloaded elementary lessons are shown one time in the All tab, but two times in the Elementary tab. Found resolution for the first issue. On iPhone messages like “You have bookmarked a lesson successfully” are rolled in from top, but they are not automatically rolled back after some seconds. Pushing the message to the top to the outside of the mobile, unveils the hidden tabs. 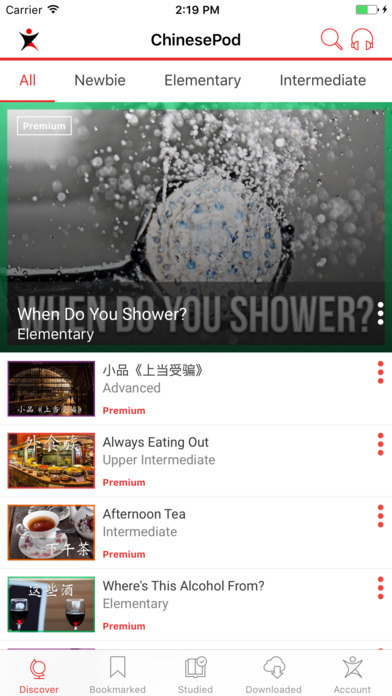 The bookmarked lessons from the Chinese pod website are not reflected in the app. Seems there are two separate “bookmarks”, one for website, one in the app. Can they be aligned? Intro, Vocabulary, Dialogue, Expansion are only shown in the Bookmarked tab. The same lesson in the Downloaded section only gives Intro. Neither Vocabulary, nor Dialogue or Expansion are shown. Please do not misunderstand the issues I have highlighted. Simply take them as my contribution to improve the app. Already in this alpha state the app is way better than the old one. Btw, might be helpful if you setup a small bug tracking software, like GitHub or similar. Ouch, maybe I’m wrong, but if I download an episode and then disable the internet connection, the episode is not presented. This was one of the major flaws of the old app. I hope this is only due to beta state. If the internet connection is mandatory, it would be really weird. Thanks for your detailed feedback @GeorgL . Regarding your above remark on downloaded lessons not having data, this should be fixed in the next update (see above: view lesson data for offline content (vocabulary/ dialogue etc). We already have a bug tracking platform, but since our most active users are already using the forum, we thought we would take requests and feedback from you guys here, and feed it into our bug tracker. Thanks. So the notification should auto hide after a second or two. This should work fine. I have just tested by repeatedly downloading a lesson, then turning on airport mode, and the lesson appears in downloads and plays the 3 audio lessons (without lesson data like vocab etc). Could you try again to confirm? Do you have a screenshot of this? The app should sync bookmarks and studied lessons between website and app. I’ve given it another try, bookmarking an new episode on the website. After updating in the app (sliding down on the “Bookmarked” tab to trigger the update) it finally showed the freshly bookmarked episode. So, no issue there. I’m sorry, but this does definitely not work on my side. I’ve bookmarked a new episode on the website, updated in the app, the lesson is shown in the bookmarked-tab, then selected the context-menu, pressed “Download” and the lesson was downloaded. At least it lasted 5-6 seconds, then the message “You have downloaded a lesson successfully” appeared. Then I enabled flight-mode on my iPhone. Selected the just downloaded episode in the bookmarked tab. The intro-page is shown without problem. But if I slide to the right, to see the “Vocabulary”-tab, the animation of the ChinesePod-logo is shown continuously. But not the vocabulary. However the app is still fully reactive. I can slide to the next tab “Dialogue” without problem, however the content - the dialogue - is not shown. Sliding back to “Intro” is possible. If I disable flight-mode and again go to the “Bookmarked”-tab, selecting the previously downloaded lesson, I get the “Intro” without problem. If I slide to “Vocabulary” the vocabulary is shown instantenously. I suspect that the downloaded data is effectively used, however there is something else attempted to be taken from online-connection (ID, session-id, cache-sync, whatsoever). And that’s prevented in offline-mode. Hi Chinesepod Team, I just downloaded the new app and trying it out. Remark: Overall good feel, but some functionality is still lacking - could be because this is the beta-version. No Audio: Big Issue. I have tried multiple ways to play lessons. Discover -> lessons, dialogue, and vocabulary review. Often will not play. If it does, there is no audio. Discover -> Vocabulary -> Will play, but no audio. Bookmarked -> lessons, dialogue, and vocabulary review. Often will not play. If it does, there is no audio. Downloaded -> lessons, dialogue, and vocabulary review. Will play, but no audio. Just in case you are wondering… I did check my volume. Search. When I search words like “rent” or “math”, the All tab shows the lessons but repeats them over and over. This only happens on some words, for instance, it didn’t work with “monopoly”. Also, if I try to search from the “Search Results” page, the keyboard does not disappear, which is a little irritating. Download Speed. Very Slow. I like to think my internet speed is not too poor for China, but I had to wait upwards a few minutes for the download to complete. At least it downloaded… Could be China internet speed… The progress bar and background downloading might help with this. Download Content on Airplane Mode. The good news is that I could play the downloaded content with Airplane mode, or at least see that it was playing since I still didn’t have any audio. I’ll keep using it and keep you posted on further suggestions for improvement. I don’t think it’s necessary to have the word “premium” in red under every single lesson. (I am logged into my premium account.) Pretty much everything is “premium” these days except for a handful of Newbie lessons, I think. I do like the “video” label. Please expand the search function to include partial words. For example, the word “neighbor” should trigger the lessons with the word “neighbors” in them. Also pinyin. I would love the search function to include the vocab lists also. This would be useful if I want to explore all the ways a certain word has been used in various lessons (especially useful for words with a lot of uses). I’ll keep testing. Thank you! Hi, Thanks for the new release, just downloaded today and seems to be really better than before. Is it possible to have a setting for the size of the text in Dialogue tab? I have the feeling the Chinese characters are a bit too small and require effort for me to keep focus and follow. Maybe also increase a bit the space between lines and characters can help. -The audio stops as soon as the phone auto-lock. Would that be possible to continue to play the audio while the phone is locked manually or automatically? I’m sorry to hear this. It sounds like our Amazon servers are being blocked in China. Where about’s are you located? Could you try using a VPN and see if that works?